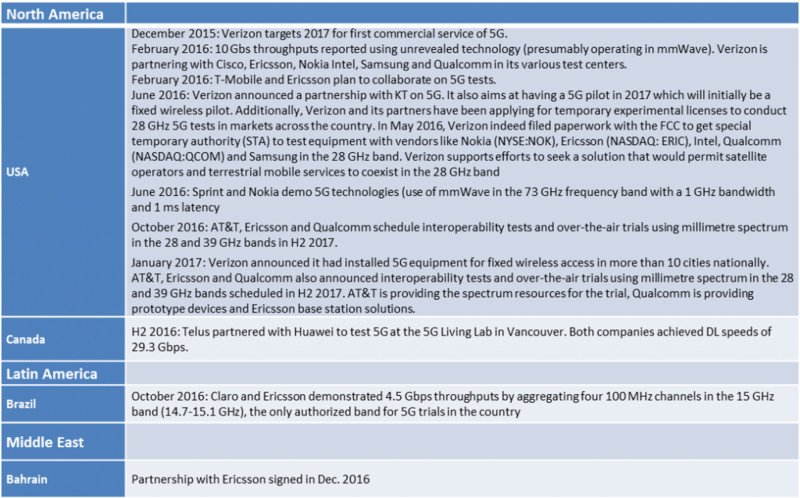 Many 5G trials are already underway! Before 5G becomes a reality, a fair amount of work remains to be done in 2017. The upcoming MWC accounts for one of the biggest dissemination opportunities. 5G will be a reality in 2020 and earlier. A number of 5G commercial launches are already planned. 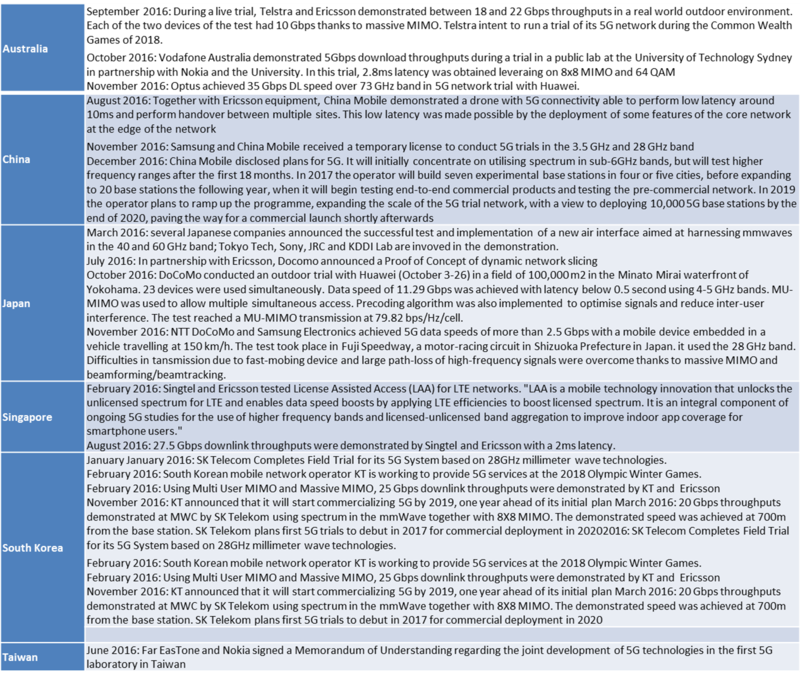 At regional level, South Korea and the USA are leading the way toward 5G commercial launches. In Europe, TeliaSonera should be the first MNO to launch services in Sweden and Estonia. Several trials or demonstrations in the mmwaves are ongoing across the world, in Australia, China, Japan, SIngapore for APAC, in the USA and Brazil for America, in the UK, Germany and France at European level.The idea is to better understand mmwave propagation characteristics. 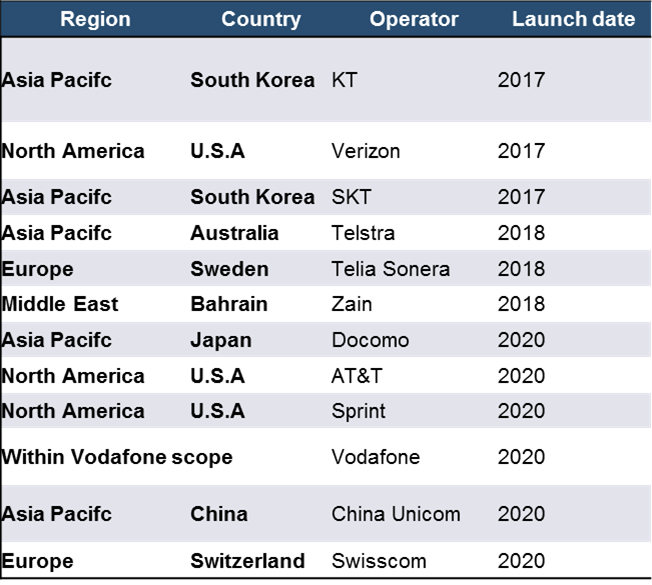 IDATE DigiWorld collected and disclosed a list of announced 5G or pre 5G launches in its “State of LTE markets – 5G initiatives and MBB spectrum” report dated December 2016. MWC 2017 preparations on full swing! 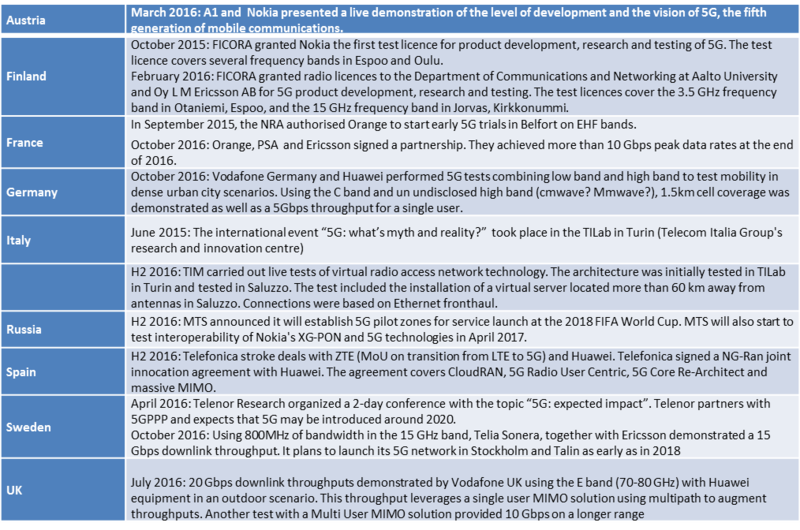 The members of the 5G Infrastructure Association invite media and ICT industry analysts to a briefing on the evolution of European 5G initiatives from Research to Trials at Mobile World Congress 2017. The event will be held on the 28th of Feb from 14:00 to 15:30 in the Press Conference Room 1, in the Media Village at the MWC in Barcelona. Feel free to attend! and do not miss the video which will open the event! The European work for the preparation of 5G has been progressing dramatically under the leadership of the 5G-Public Private Partnership (5G-PPP), notably after the launch of the strategic projects of the first phase in 2015. The progress achieved to date will be presented in a new White Paper – “5G innovations for new business opportunities” – which will be issued at the event. The paper identifies recommendations of the EU telecom sector towards harmonized 5G standardisation, spectrum, deployment and regulation from this work. During the event, Roberto Viola, Director General of DG CONNECT at the European Commission, as well as executives from leading global technology member companies, will discuss the progress being achieved through European 5G Research, the emergence of 5G standards, and prospects for investments in the new infrastructure, while representatives of the vertical industries and the public sector will outline their needs and expectations for 5G. A major discussion point will be technology experiments, validation tests, and eventually field trials as outlined in 5G Action Plan that will be needed between now and 2020 to facilitate the development of 5G. The roadmap for the implementation of advanced pre-commercial trials, to be launched in key sectors in 2018 and to be promoted at EU level, will then be presented, in view of ensuring Europe leadership in the context of the accelerated global agenda for the introduction of 5G. Registration is free but highly recommended. You can easily make it online. 5G-Crosshaul presentation from Bob Gazda (InterDigital) at the “5G Impact” session, hall 4 Auditorium 5 on Thursday 2 March 2017, from 11:30 to 13:00 featuring video demonstration of 5G-Crosshaul solution with a remote surgery application. Get your personal copy of the “5G Innovations for new business opportunities” brochure prepared by the 5GIA on the b<>com booth Hall 8.0 Stand #8.OF17! EuCNC 2017 is the 26th edition of a successful series of a technical and scientific conference open to the world research community, sponsored by the European Commission, in the area of Telecommunications, focusing on communication networks and systems, and reaching services and applications. It aims at showcasing the results of the consecutive programmes on R&D and projects co-financed by European programmes, as well as presenting the latest developments in this area. The conference will have regular oral and poster sessions, and well as panels, tutorials, workshops, keynotes, and demos. 5G PPP Phase 1 projects are planning to be there and showcase latest results and initiatives. ➧ Read additional details here or there. mmMAGIC is organising the 2nd International Workshop on Millimeter Wave-Based Integrated Moible Communications for 5G Networks (mmW5G) on March 19, 2017 in San Francisco (USA). The workshop is co-located with IEEE WCNC 2017 (19-22 March 2017). Millimeter wave communication has generally been acknowledged as one of the enablers to meet the requirements of future communication systems, in particular to provide the high bandwidth necessary to achieve the expected high data rates for extreme broadband. However, to overcome the adverse propagation conditions at higher frequencies, high gain beamforming at transmitter and receiver ends on multi-node co-ordination solutions are actively pursued now. This kind of directional, coordinated communication leads to a new design paradigm for future systems which is much more complex than their counterparts operating at lower frequencies. There are multiple challenges in properly understanding the mm-wave radio channel, designing radio systems with multiple RF chains at these higher frequencies, channel estimation and beam tracking under mobility, co-ordination and interference management in ultra-dense networks etc. However there have been significant advancements in the mm-wave technologies over the past few years, leading to prototype systems now being developed. This workshop will bring together the leading names in industry, academia and research institutes to discuss and debate the latest developments in this area. It offers a unique opportunity for researchers in this field to disseminate their results in all areas of mm-wave communications to a diverse audience. mmMAGIC, METIS-II, 5G-Crosshaul and 5G NORMA are organising a workshop on RAN architecture and integration on March 30-31, 2017 in London. Day 1 will focus on 5G-PPP work and Day 2 expand the discussion to all aspects of 5G: from Theory to Practice. The workshop is open to all on both days . Registration is open for both days, here. For additional information on the event, please contact David Gutierrez Estevez, Samsung Electronics. ➧ Read more on the workshop home page here, with latest info on the agenda and logistics. After the successful events of 2016, held in China (Beijing) and in Europe (Rome), the series of high level events on the 5G ecosystem continues this year in Japan (Tokyo), on May 24-25. The 3rd Global 5G Event is hosted by the 5G Mobile Forum (5GMF). It will offer participants lively debates around 5G spectrum, standards and deployment as well as exciting showcases of the latest 5G developments from industrial players. 5GMF is also organising an exhibition, which will be held in the Tokyo Big Site, co-located with the Wireless Technology Park (WTP) 2017, a major event which in 2016 attracted more than 47,000 visitors.